BACKGROUND: Helicobacter pylori is associated with several upper gastrointestinal conditions including chronic gastritis, peptic ulcer disease, and gatric malignancy. Proton pump inhibitor-based triple therapies are considered the standard regimens for H. pylori eradication, but the optimal duration of therapy is controversial. To prevent infection and complications, local studies should be undertaken to evaluate H. pylori eradication rates in a country. OBJECTIVES: We compared 7-day and 14-day regimens to determine the optimum duration of triple therapy for H. pylori eradication. We undertook a prospective randomised comparative trial of 7-day and 14-day triple therapy regimen for H. pylori eradication at the Aga Khan University Hospital, Nairobi; 120 patients with dyspepsia and H. pylori infection were randomised to receive esomeprazole, amoxicillin and clarithromycin for either 7 days (EAC 7) or 14 days (EAC 14). Compliance and side-effects were assessed 2 weeks after the start of therapy and H. pylori eradication was assessed by stool antigen tests 4 weeks after treatment. RESULTS: Both the intention-to-treat (ITT; N=120) and per protocol (PP; N=97) analyses showed no significant differences between the eradication rates of EAC 7 (ITT 76.7%; PP 92%) and EAC 14 (ITT 73.3%; PP 93.6%) (ITT p=0.67; PP p=0.76). Poor compliance was reported in one patient in the EAC 14 group. The incidence of adverse events was comparable in the two groups. CONCLUSION: One-week and 2-week triple treatments for H. pylori eradication are similar in terms of efficacy, safety and patient compliance. The Maastricht III Consensus Guidelines state that effective eradication treatment should be successful in more than 80% of intention-to-treat (ITT) and 90% of per protocol (PP) treated patients, and that local studies should be done to establish the duration of treatment and eradication rates.1 In Kenya the first-line treatment is a PPI, amoxicillin and clarithromycin, but the optimal duration of therapy remains controversial. As we are not aware of local published studies to establish the rate of H. pylori eradication with the triple therapy and with different treatment periods, we decided to determine the optimum duration of triple therapy for H. pylori eradication. All patients who presented between December 2009 and May 2010 with dyspepsia and who were positive for H. pylori on stool antigen tests were enrolled. Exclusion criteria were: previous attempts at H. pylori eradication, intake of bismuth, H2-antagonists, PPIs, or antibiotics within the 3 months prior to entry to the study, a history of intolerance and/or allergy to the study drugs, pregnancy or lactation, and alarm features. Alarm features were defined as age >45, gastrointestinal bleeding, anaemia, early satiety, unexplained weight loss, progressive dysphagia, odynophagia, recurrent vomiting, a family history of gastrointestinal cancer, and previous oesophagogastric malignancy.2 The study was approved by the local Ethics Committee and informed, written consent was obtained from each patient. This was a prospective randomised investigator-blind comparative trial of 7- and 14-day triple therapy for H. pylori eradication conducted at the Aga Khan University Hospital, Nairobi. All patients who presented with dyspepsia and who were H. pylori-positive on stool antigen testing were randomised by simple computer-generated randomisation to receive either 7-day or 14-day triple therapy (esomeprazole 20 mg twice a day, amoxicillin 1 g twice a day, clarithromycin 500 mg twice a day). After 2 weeks the patients were reviewed by the principal investigator for assessment of side-effects and compliance. A stool antigen test was repeated 6 weeks after the start of therapy to confirm eradication of H. pylori. The patients were not charged for reviews at 2 and 6 weeks and a free H. pylori stool antigen test was performed to confirm eradication. Patients who still had H. pylori at 6 weeks were referred to the gastroenterology clinic for second-line therapy. Hypothesising a difference of 20% between eradication rates achieved by the two regimens, and fixing a statistical power of at least 80% with a value of á<0.05, we calculated the minimal number of patients to be included in each group (1 week or 2 weeks) to be 46. With an estimated drop-out rate of 30%, we then needed 120 patients in total and 60 patients in each group. Data were analysed using SPSS version 15.0. Analysis of baseline characteristics and eradication success between different treatment protocols were performed using the chi-square test. The t-test was used to analyse the age distribution between the patient groups. Data were analysed according to ITT and PP criteria. The ITT analysis included all patients randomised to a treatment group, whereas in the PP analysis patients lost during follow-up or showing low compliance were excluded. The incidence and severity of adverse events in the two groups were also compared using the chi-square test. During December 2009 and May 2010, 146 patients with H. pylori-positive dyspepsia were identified. Of these, 26 were excluded: 21 did not meet inclusion criteria and 5 did not give consent. Of the 21, 3 were pregnant, 4 were breastfeeding, 3 were allergic to penicillin, 6 had used PPIs within 4 weeks of presentation, and 4 had alarm features. The patients with alarm features were booked for endoscopy and follow-up in the gastroenterology clinic. Patients who did not give consent were given appropriate standard therapy. 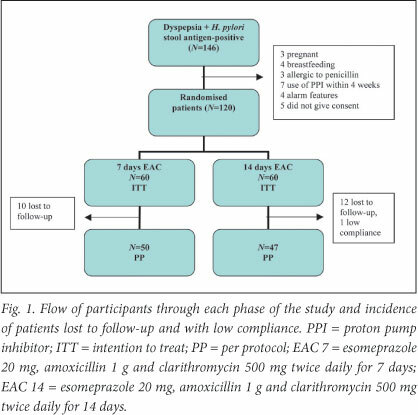 Remaining for enrolment and randomisation were 120 patients; 60 were randomised to receive esomeprazole 20 mg twice daily in combination with amoxicillin 1 g twice daily and clarithromycin 500 mg twice daily for 1 week (EAC 7) and 60 the same regimen for 2 weeks (EAC 14). In the 7-day group 10 patients were lost to follow-up; 3 had travelled out of the city, 2 could not be reached by telephone and 5 did not see the benefit of coming back as they were asymptomatic. All the patients in the 7-day group were >90% compliant (Fig. 1). In the 14-day group 12 patients were lost to follow-up; 4 had travelled out of the city, 2 could not be reached by telephone and 6 did not see the benefit of coming back as they were asymptomatic. One patient in the 14-day group was not compliant. All patients were considered for ITT analysis, but only 97 for PP analysis, 23 patients (19.2%) having being excluded because they had been lost to follow-up (n=22) or showed poor compliance (n=1). The mean age was in the fourth decade with no statistically significant difference between the two groups, and men and women were equally represented. Homogeneity in the basic demographic data allowed the two groups to be comparable. All patients who had dyspepsia and were referred for endoscopy had H. pylori-positive gastritis. Patients with histology-proven H. pylori-positive gastritis were equally distributed between the two groups (Table 1). In the EAC 7 group 10 patients (16.7%) were lost to follow-up whereas in the EAC 14 group 12 (20%) were lost to follow-up, but again the difference is not significant (p=0.24). Most of the patients who did not come for follow-up visits felt better after the treatment. Our objective was to determine and compare the H. pylori eradication rates between 7- and 14-day triple therapy regimens according to the ITT and the PP analysis. All patients were considered for ITT analysis, but only 97 for PP analysis. The 23 patients (19.2%) excluded were lost to follow-up (n=22) or showed poor compliance (n=1). On ITT analysis EAC 7 eradication rates were 76.7% (95% confidence interval (CI) 66 - 87.4%) whereas for EAC 14 the eradication rates were 73.3 % (95% CI 62.1 - 84.5%). The difference between the two groups was not statistically significant (p=0.67). On PP analysis, the eradication rate in the EAC 7 group was 92% (95% CI 84.5 - 99.5%), which was slightly lower than the 93.6% achieved in the EAC 14 group (95% CI 86.6 - 100%), but was not significant (p =0.76). There was no significant difference between EAC 7 and EAC 14 regimens in either the ITT (p=0.67) or the PP (p=0.76) analysis. The difference in eradication rates between the EAC 7 and EAC 14 groups was -3.4% in the ITT analysis and 1.6% in the PP analysis (Table 2). 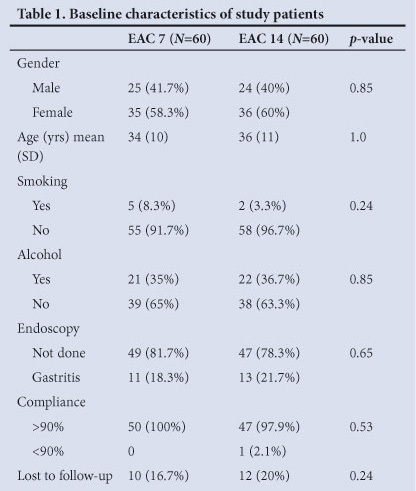 Gender, smoking habit, alcohol consumption and prior endoscopy had no influence on eradication rates, but our study was not powered for this conclusion. These factors were equally distributed in both groups and therefore unlikely to have significantly influenced the results. Compliance was analysed in 98 patients, after exclusion of the 22 patients lost to follow-up. Compliance was found to be inadequate (intake of <90% of total tablets) in 1 patient (1.02%). Compliance was good in 97 (98.98%) of the participants. However, 22 (18.3%) were lost to follow-up. Compliance was comparable in both groups 100% in the EAC 7 group and 97.9% in the EAC 14 group (p=0.53). The only patient who had <90% compliance was in the EAC 14 group. Ten patients in the EAC 7 group (16.7%) were lost to follow-up whereas 12 patients (20%) in the EAC 14 group were lost to follow-up (p=0.24). Possible adverse effects of the regimen were headache, nausea, vomiting, diarrhoea, loss of appetite, taste disturbance, abdominal pain and rash. Taste disturbance was the commonest adverse effect; 17 (34%) were affected in EAC 7 group and 25 (53.2%) in the EAC 14 group (p=0.057). All adverse events were mild and did not necessitate withdrawal or interfere with therapy. There was no statistically significant difference in the experience of side-effects between the treatment groups. No data or consensus about the duration of treatment for H. pylori in Kenya were available. Therefore we evaluated the triple therapy of esomeprazole 20 mg twice a day, amoxicillin 1 g twice a day and clarithromycin 500 mg twice a day in the first randomised controlled study comparing the efficacy of 1 and 2 weeks of triple therapy for H. pylori eradication in patients in Kenya. 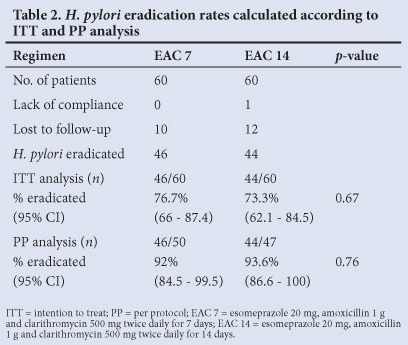 We found that 1 week of treatment with esomeprazole, clarithromycin and amoxicillin achieved H. pylori eradication rates of 76.7% and 92% by ITT and PP analyses, respectively. Extending the treatment to 2 weeks does not enhance eradication rates (73.3% and 93.6% by ITT and PP analyses, respectively). The difference between eradication rates achieved with 1 and 2 weeks of triple therapy is not statistically significant. Studies of PPI-based triple therapy for 7 days, mainly from European countries, confirm that this remains a valid duration for H. pylori treatment.11 Our results are consistent with recent studies such as the HYPER study12 from Italy, which was a large, multicentre, double-blind and randomised study comparing the efficacy of 1- and 2-week regimens of omeprazole, amoxicillin and clarithromycin. Their ITT (N=907) and PP (N=661) analyses showed no significant differences between the eradication rates at 1 week (ITT 79.7%; PP 83.6%) and 2 weeks (ITT 81.7%; PP 84.9%) (ITT p=0.53; PP p=0.71). Laine et al.13 reported that ITT eradication percentages with triple therapy (omeprazole, amoxicillin and clarithromycin) were 86% at 7 days, 90% at 10 days and 92% at 14 days in a study at a single institution. A multicentre study in 11 centres in Asia and Africa, where patients with endoscopy-proven duodenal ulcer and who were H. pylori-positive were treated with clarithromycin 500 mg, omeprazole 20 mg, and amoxicillin 1 000 mg, all given twice daily for 7 days, recruited a total of 117 patients. Overall, H. pylori eradication rates were 85% by PP analysis and 80% by ITT analysis. Only 25 patients were from South Africa, where eradication rates were 86% (19/22) (95% CI 65.1 - 97.1%) by PP analysis and 76% (19/25) (95% CI 54.9 - 90.6%) by ITT analysis.14 These results are in keeping with our study. One week of triple therapy remains the recommended first line treatment for H. pylori eradication12 in regions where primary resistances of clarithromycin or metronidazole are lower than 15 -20% or 40%, respectively. Data on H. pylori antibiotic sensitivity profiles in Kenya are scarce, a recent study showing all H. pylori largely sensitive to clarithromycin (100%), amoxicillin (100%) and metronidazole (95.4%). There was, however, occasional resistance to metronidazole (4.6%).15 This confirms our finding that 7-day triple therapy is adequate for H. pylori eradication because local resistance rates are very low. Compliance with antimicrobial therapy is better with short-duration therapy. This is particularly relevant with H. pylori eradication regimens because side-effects such as diarrhoea or taste disturbance can lead to discontinuation of therapy in some patients, with potential treatment failure. All our patients were educated on the importance of H. pylori eradication and possible side-effects, with the result that patient compliance was high. In conclusion, this study shows that the efficacy and safety of 1 week of triple therapy including esomeprazole with amoxicillin and clarithromycin does not differ significantly from 2 weeks of treatment for the eradication of H. pylori.